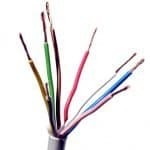 The recent explosion of connected products has made its way into the kitchen. 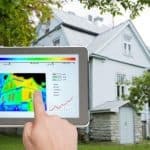 Some of these gadgets are pretty cool and have a bright future. Others, not so much. I have scoured the web and found 11 products that I think enhance your kitchen experience and can make your lives more convenient. 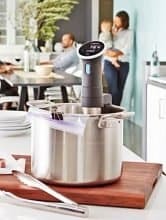 You’ll be amazed at how easy it is to get gourmet flavor food right from your own kitchen with the Anova WiFi Sous Vide Precision Cooker. 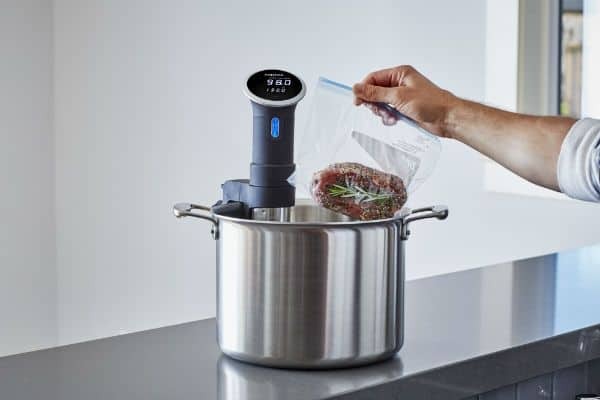 Sous Vide is a cooking technique used by gourmet chefs around the world. It involves sealing the raw food in a water-tight plastic container and then submerging it in a hot water bath. The temperature of the water bath can be controlled precisely and the food gets cooked to the exact temperature for optimal taste-bud pleasing results. Clamp the cooker to the side of a pot and fill the pot with water and ice. Then, put your food in a freezer bag and make sure all the air bubbles are removed. Submerge the bag in the pot. Find a recipe and start the cooker from anywhere using the app from any WiFi enabled device. Problem it solves: Gives literally anyone the ability to cook gourmet quality meats sous vide. Value: If you’re already a great cook, this may not be a wise investment. However, if you’re like me, this gadget could pay for itself after a few nights of choosing to let the Anova do supper instead of going out to eat. 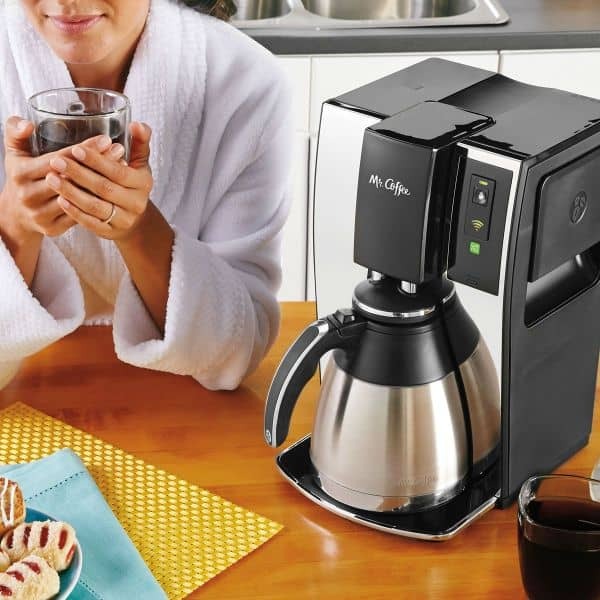 The Mr. Coffee Smart Wifi-Enabled WeMo 10-Cup Optimal Brew Coffeemaker gives you a quality cup of coffee. Plus, it gives you the ability to schedule it to start brewing at anytime from anywhere. What it does do is give you an advanced scheduling function with the convenience of doing it from a touch-screen smartphone instead of a clumsy LCD screen on a programmable coffee maker. It also will send you an alert if it’s scheduled for a future brew, but it’s missing some ingredients. Unfortunately, it doesn’t automatically load the water, coffee or filters. Someday a robotic WiFi coffee maker will probably make its way to the consumer market and when that day comes it can take its rightful place on this list. Problem it solves: Allows you the convenience to schedule your coffee to be brewed at any time. Value: Paying a premium price for what basically amounts to an enhanced scheduler is questionable. It would be nice to be able to adjust brew temperature and strength as well. Perhaps in a future version? 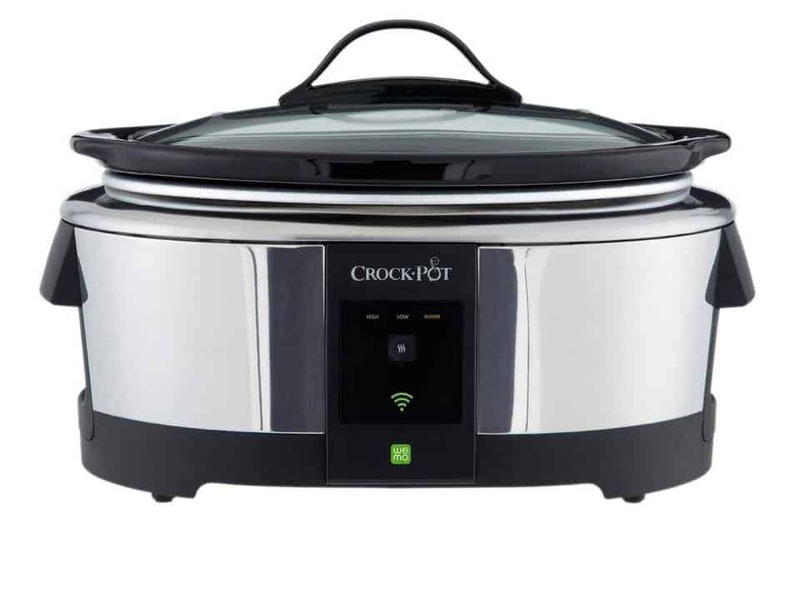 The Crock-Pot Smart Wifi-Enabled WeMo 6-Quart Slow Cooker is another classic kitchen appliance that has gotten the WiFi facelift. The WeMo app allows you to set a temperature and cook time. When it’s done cooking, the heat automatically switches to “warm” and the app sends you an alert letting you know your food is ready. Being able to program a Crock-Pot is a useful feature, so why not make it easier with a mobile app? Right now, the app allows you to remotely start/stop and change temperature. It will also send you alerts when the food is done. Problem it solves: Lets you program your Crock-Pot from the convenience of a smartphone. Sends you an alert when your food is ready. Value: The WiFi version costs about twice as much as the simpler programmable version. If you tend to leave the house with your cooker on high and forget about it, then it might be worth it. Otherwise, you will probably find yourself thinking you should have saved some money and just bought the cheaper programmable version. 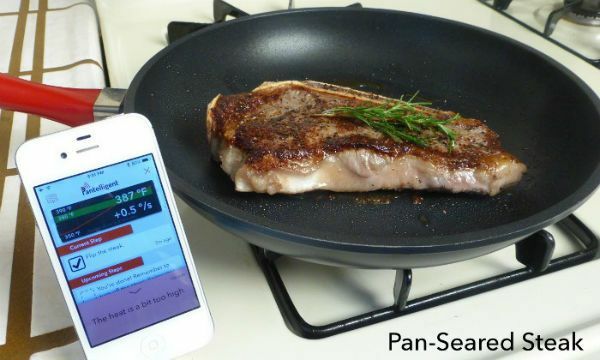 The Pantelligent Intelligent Frying Pan is a virtual chef that will guide you step-by-step through preparing a meal. It tells you when to flip, when to add ingredients, and when it’s done. The app includes a library of recipes ready for you to saute, simmer and sear your way to a delicious meal. An embedded sensor measures the temperature of the cooking surface and adjusts the required cooking time as you go. If you really want to take it up a notch, then you can look into Pantelligent’s Autopilot feature. In order to use the autopilot, you need an extra $100 of accessories (an electric hot plate and a WeMo WiFi-enabled switch). 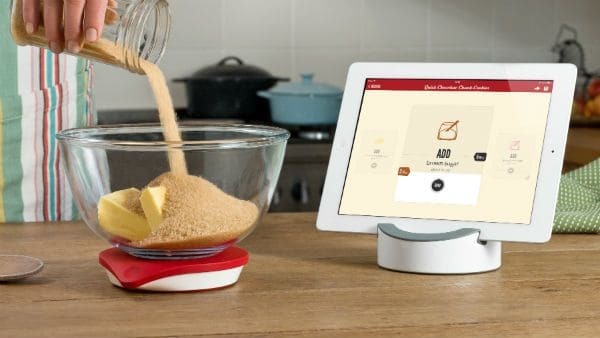 In autopilot mode, the temperature is controlled automatically so all you need to do is worry about flipping, stirring, and adding ingredients when the app tells you to. Problem it solves: If you can follow directions, you can go from a complete novice to a competent cook in one night. Value: The pan is solid and the non-stick coating is very good. Experienced cooks probably won’t get much value out of this, but anyone who feels like they have some things to learn could benefit from the Pantelligent. I would also like to see a few more recipes included in their library. I’m sure that will happen with time. Instead of using a bunch of cups and spoons to measure out all your ingredients, why not use a scale? The drop kitchen app includes hundreds of interactive step-by-step recipes. Each recipe shows you all the tools and ingredients you will need. It also allows you to adjust the size of the recipe and automatically calculates the correct scaled amount for each ingredient. Problem it solves: Eliminate all your measuring cups and spoons from the cooking process. Adjust the size of your recipes automatically and never mess up those calculations again. Value: It’s pretty spendy if it was just a scale. Luckily it is much more than that. If you do a lot of baking, the Drop could be your new best friend. 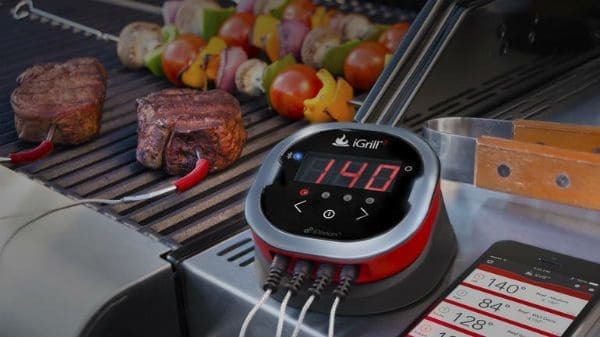 This Bluetooth thermometer help to make you the Grill Master you’ve always wanted to be. It comes with 2 probes and can connect up to 4 probes. Each probe can be monitored using the app. You can also use preset temperature alarms or create custom alarms to let you know when your food needs flipping or is done. Problem it solves: Monitor temperature and get alerts from the comfort of your home while grilling. Value: It’s not too much more expensive than some other electronic meat thermometers so why not go for the one with Bluetooth and the app? You’re probably thinking, “Why would a water pitcher ever need WiFi?” Well, I tend to be a little stingy and/or forgetful when it comes to changing my water filters and I’m probably not the only one. 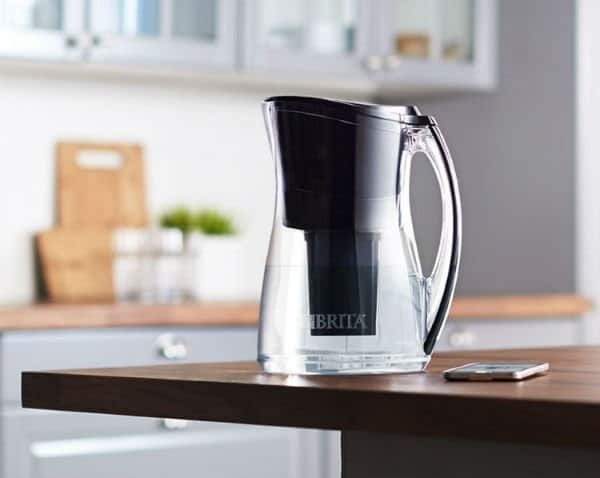 The Brita smart pitcher tracks usage and automatically orders its own replacement filters through Amazon Dash Replenishment. Value: At a price that’s competitive with other premium water pitchers, this Brita with WiFi is a decent value. 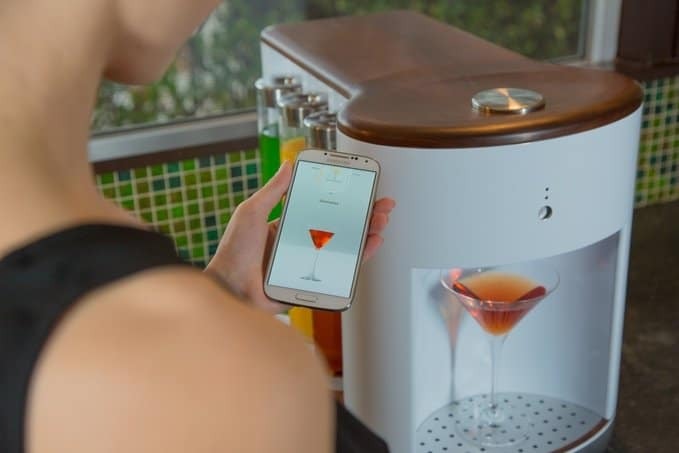 The Somabar can mix and pour drinks in 5 seconds with the touch of a button. You can load up to 6 different types of liquor into the Soma Pods. Then, use the app to find drink recipes using the liquor you have loaded into the Somabar. Click the following link for more details on the Somabar robotic bartender. Value: This product is still in the pre-order stage. If it works as they say it will, it will be a steal at the pre-order price of $429. The Cinder precision griddle lets you cook sous vide style meals without the water bags or hassle. The Cinder automatically adjusts time and temperature to cook whatever you want just the way you like it. Choose how you like your steak done in the app and cinder does the rest. It even has the ability to sear your steak at the end of the cooking cycle to give it the fresh off the grill crispiness. 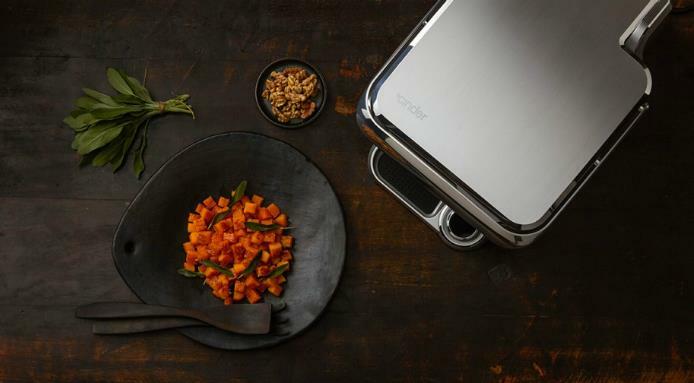 Problem it solves: Sous vide style cooking plus the ability to sear all done automatically. Value: The only people that won’t enjoy this are the people that truly love to stand there and physically cook their own meals. The Braava mopping robot is a time saver and a back saver. It’s basically a robotic Swiffer. It mops and sweeps hard floors in kitchens bathrooms and other small spaces. It minimizes the amount of time you have to be on your hands and knees doing the scrubbing yourself. 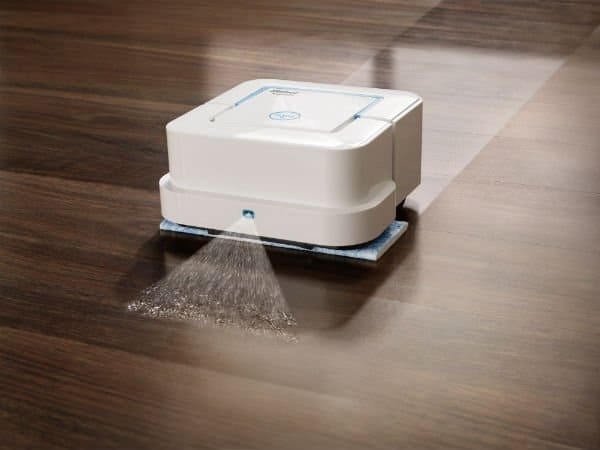 Your floors will stay cleaner with this robot. The Braava gets into hard to reach places like corners and below cabinets. It avoids stairs and rugs won’t harm or spray the walls or furniture. The Braava may not get it as clean as you do in one pass, but one of the great advantages of robots is their stamina. You can send the Braava out to clean your floor every day so that it stays as clean as ever. Problem it solves: Cleans your hard floors so you don’t have to. Value: The Braava would be amazing if it had a docking station that switched out its cleaning pads and recharged its batteries. It doesn’t. However, it will still clean your floor while you’re busy doing something more leisurely, which is pretty cool. 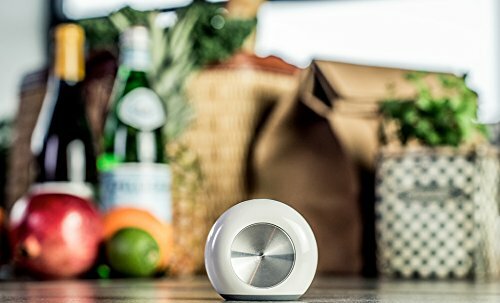 The Hiku is a little device that helps you build your shopping list. Run out of an item? Before you throw it away, scan the barcode on the Hiku and it gets added to your list. Need something else that you don’t have a barcode for? Tell Hiku what you need and its voice recognition will add it to your list. The added items are automatically synced to the app on your phone. You can even make different lists for different stores. The Hiku is meant to always stay in your kitchen. Set it on your counter so it’s always available. Problem it solves: No hassle way to build a grocery list. Value: If your grocery list is huge and you are constantly buying the same products, the Hiku seems like a no-brainer. Are there some items I left out or some that don’t belong? Let me know what you think in the comments below! The Brita filter with dash button is awesome. I own a few amazon dash buttons and LOVE how convenient they are. The Brita filter I own gets a new filter every….year? Ha. I’m not good with keeping up on replacing the filter. Mostly because I forget! This seems like a perfect alternative. Haha, I think there was a time back in college where I went a couple years without changing it. I figured if there’s still water flowing through it, it must be good right? Wow! Now I need more gadgets! I think you could easily market the Somabar Robotic Bartender to stay home moms! Have you heard of the UE Boom Wireless speaker? It’s not necessarily in the kitchen, but that is where I have mine. It sinks to your smart phone and plays music wirelessly. It’s such a cool gadet too. I am loving this site with so much technological kitchen items. Wow impressive items to buy. Which one do I want the most! LOL! I am thinking that ibot mopping jet is really handy as I really do not like cleaning floors. This one even mops…sweet! How ugly is it to clean? Honestly, I did not know most of these items existed so love your site!!! I will bookmark it and come back here to buy! I would love the irobot mop! I have a irobot sweeper and now am thinking i could get the robotic mop. Its great to just click a button and it cleans for you, it really does it all for you. Really nice article! Great site. I do love a gadget. However these days I’m so much more aware of EMFs and the fact that unnative EMFs surround us all day long. So unfortunately I’m trying to cut back on such items and probably won’t buy anything here for that reason. That being said, I really like your site, and I wish you luck with it!! Hey Nick, thanks for the compliment. These products mostly use WiFi which is a low-power, non-ionizing radiation that is considered harmless to humans. Do you have evidence to the contrary? Oh Kitchen heaven! Everything done for you at the touch of the button, I had no idea there was the robotic mop and the precision slow cooker, would be an asset in my kitchen I am sure. I will have to look at some of these items further. Thanks for this was a great resource for me! These gadgets are awesome. I love the coffee maker and the water filter. I am going to tell my father about the grill thermometer. This is a great article. I will be back to check out what you review next. Hi! These products are simply amazing! I’ll take one of each! I think the one that would be most use to me is the kitchen scale. It would be great to not have to wash out all those measuring cups. I’m wondering if you can add your own recipes to the app. Any idea? Hi Marge, avoiding the cup washing is a nice benefit to me too, especially for sticky things like peanut butter or shortening. Currently, you cannot add your own recipes. They are working on adding that feature, but in the meantime, there are still hundreds of recipes in the app and more being added regularly. Wow, I had no idea there were so many smart appliances out there! Thanks for all the information and the pics. I think the grill thermometer would be a fantastic gift for anyone. And who wouldn’t want a robotic bartender, that would be great out at the lake in the summer and for Christmas parties. Gee – all these gadgets are great – I need the wifi slow cooker, not to mention the mopping robot? Will you be covering robotic vacuums? Is there one that does both? Love the coffee maker….much better than the typical programmable one on my counter. Wow, I didn’t know all these really cool gadgets existed! The Brita one is a must, as I am useless at changing the filters, then the mop, I will watch it clean while I sample the cocktails! I am amazed at the kitchen items featured on this blog. I love the grill Bluetooth thermometer and the Mopping Robot as well as the Crock Pot. This would be ideal for the working Mom. Great ideas. Great site! This not only gave me some great ideas for myself (baking/cooking is a huge hobby of mine!) but also gave me some great gift ideas for some of my friends and family! I’ll be coming back here! The grill thermometer would be an amazing addition to my collection of kitchen toys. Running between the kitchen and the grill can be a challenge. Knowing just when things are up to temperature would be fantastic!